Sheer love of the job and commitment to children. 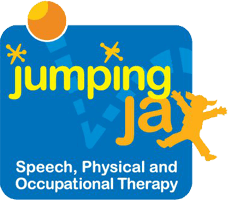 At Jumping Jax, we work together with your family and any other involved therapists, coordinators, and educators to develop a treatment plan unique to your child. Together, we'll formulate objectives and goals based on your child's skill level and developmental milestones. With each child we see, we aim to improve self-esteem, attention and cooperative play skills. Your child will receive services in an intimate and very hands-on setting. We hope to be a resource for both you and your child. As much as we love working with children, our goal will always be to graduate them from our services to be successful, independent and confident. Amanda graduated with a Bachelors of Science in Kinesiology from Indiana University and a Master of Physical Therapy from Rutgers University/UMDNJ in the Spring of 2001. She evaluates and treats infants, toddlers and children with a wide variety of developmental, neurological, musculoskeletal, and congenital impairments. Amanda has extensive experience in treating children with Torticollis and babies and toddlers who are late to achieve milestones such as rolling, crawling, pulling to stand and walking. Amanda incorporates her passion for physical therapy with her love of athletics and has completed extensive course work in Torticollis, Sensory Integration, NDT (Neuro Developmental Training) with a focus on babies, Pediatric Orthopedic Rehabilitation, Pediatric Gait, care post-NICU, DIR/Floortime, and Communication Disorders. She has a certification in Sensory Integration, including administering and interpreting the Sensory Integration Praxis Tests (SIPT). Additionally, she holds a certification in Interactive Metronome. She has treated in the home, special education pre-schools and regular education schools. Additionally, she has worked as a primary evaluator for Early Intervention (ages 0-3) and CPSE Preschool (ages 3-5), as well as a screener for the CSE School Age population (ages 5-21) determining gross motor delays. Amanda is a sought-after educator and has presented multiple workshops for parents, special education preschools, hospitals and elementary schools throughout her career on a variety of developmental, neurological and musculoskeletal topics. She has a primary understanding of American Sign Language. Amanda lives on the Upper West Side with her husband and children. Karinna received her Masters Degree in Occupational Therapy from Tufts University in Boston, Ma in 2001. Her undergraduate degree was conferred by The George Washington University in Washington D.C in 1998. Karinna began her work in 2001 in Adult/Pediatric Acute Care and Adult Inpatient Rehabilitation at The Rusk Institute in NYC. In 2004, she moved to Washington DC and worked for 4 years as an independent contractor in both school based and sensory integration clinics performing evaluations, direct treatments, consultations, and school observations. From 2007-2010, she co-founded and ran Little Hands Occupational Therapy , which provided treatment, workshops, evaluations and screenings to various charter and private schools in Washington DC, New York, and Connecticut. She has extensive training in Sensory integration, Handwriting without Tears/handwriting intervention, and developmental delays in children ages 0-18 years old. She is a certified provider of The Listening Program. Karinna is bilingual in Spanish and English and is a proud mother of two. Emily is a licensed Speech-Language Pathologist who holds a Certificate of Clinical Competence from the American Speech-Language Hearing Association. She is also certified as a Teacher of Speech and Language Disabilities. Emily received a Bachelor of Arts degree from the University of Wisconsin-Madison and a Masters of Science in Communication Disorders from the University of Texas-Dallas. She has worked in both public and private schools, where she served preschool, elementary and middle school children with a variety of speech and language disorders. In addition, she has delivered private, home-based speech and language services to the birth to 3-year old population. Emily currently provides assessment and therapy for children ages 18-months to adolescence that have difficulties with articulation/phonology, expressive & receptive language, fluency, and pragmatic/social skills. She has specific training and expertise in autism spectrum disorders, augmentative communication, and play-based assessment. She enjoys collaborating with parents, teachers, and other professionals and believes that teamwork is vital throughout the therapy process. Emily is an avid reader and cook, as well as a new auntie.